The full extent of health and quality of life risks are unknown and potentially severe. Health concerns that aerosol spray drift from manure irrigation could carry pathogens, particulates, antibiotics, endocrine disruptors, cleaning compounds, toxic gases (hydrogen sulfide and ammonia), and ‘super bacteria’ including LA-MRSA. Concerns that contaminants could affect the general population and especially those with compromised immune systems and elderly; concerns that those negative health effects could be magnified because aerosols penetrate lungs and carry toxins to the bloodstream more directly than if ingested. Quality of life concerns, reinforced by reports from people who have complained of worsening respiratory health, poor air quality, increased airborne particulates, odor, and contamination of their property as a result of nearby manure irrigation. The potential for contamination of surface water and wells from irrigation application, especially in areas where access to groundwater is more direct such as in sandy soil or karst. 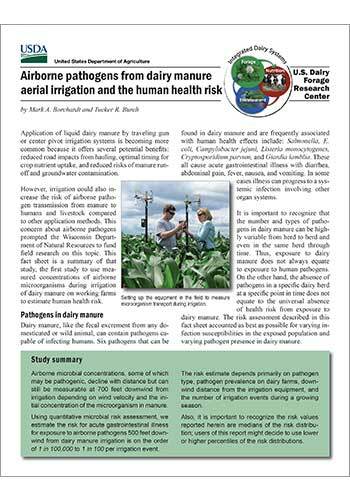 There are concerns about runoff from precipitation events after manure irrigation application. 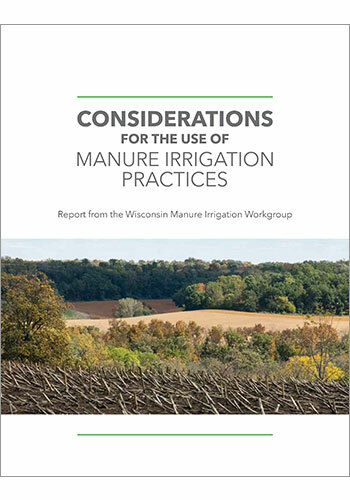 Groundwater quantity concerns that manure irrigation might use excessive amounts of groundwater resources and may draw down wells. There are concerns that existing and future setbacks will be inadequate to protect neighbors, surface waterways, and crops in nearby fields. Organic farms are concerned about the risk of losing organic certification due to spray drift depositing materials on crops. There are concerns that monitoring implementation of manure irrigation practices would be difficult and impractical. These expressed benefits and concerns helped shape the agenda for the workgroup. Throughout its activities, the workgroup welcomed public input. There has been relatively little available research on the actual aerosol drift and related effects of manure irrigation. Research reports and web-links to existing information can be found at the “resources” page of this website. Share your comments and questions regarding the Workgroup Report.